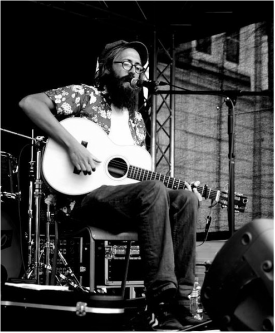 Jim Evans is a folk singer and songwriter who, with a lyrical approach to the genre, draws in elements from a vast scope of roots music. He has firmly set up camp in a tradition of songwriters who discover, borrow and then take the genre to a new place, often with vivid imagery at its centre. His latest album, 'Milk Teeth' was released in May 2016, a follow-up to 2014's ‘On Seeds and Shoes’. Jim tours extensively in the UK, and in Germany under record label and booking agent, Tonetoaster Records. He's also a regular name of UK festival bills and has clocked up supports for some great artists including Bob Lind, CW Stoneking, Ben Ottewell (Gomez), Micah P Hinson, Son of Dave, Lach and The Wave Pictures.